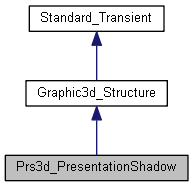 Defines a "shadow" of existing presentation object with custom aspects. Constructs a shadow of existing presentation object. Do nothing - axis-aligned bounding box should be initialized from parent structure. Returns view affinity of the parent presentation. Returns the id of the parent presentation.